Lots of book-themed benches are popping up all around London, thanks to National Literacy Trust’s experiential marketing campaign, ‘Books about Town’. With the hope that it would remind Londoners on the streets of the joy of reading books, the Books about Town initiative consists of 50 books interpreted as benches dotted around London. 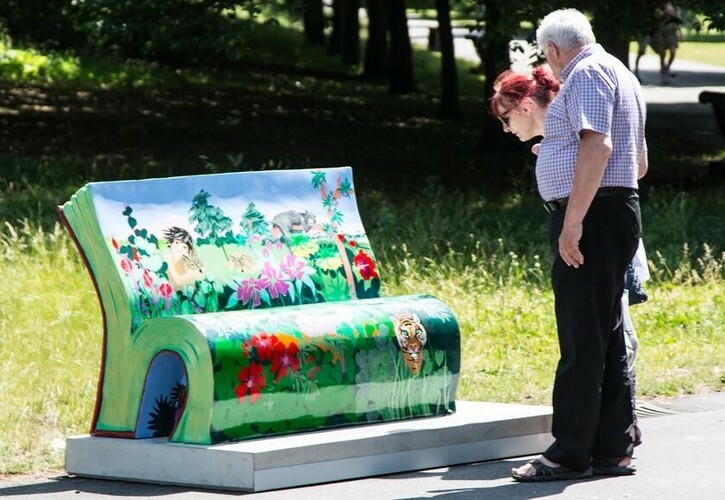 The benches have been designed by artists and writers to resemble open books, and include Peter Pan, Paddington Bear, the Claire Bean series, the Jacqueline Wilson series, War Horse, Sherlock Holmes, Mary Poppins, James Bond, Poirot and How to Train Your Dragon to name a few. On launch day, author of How to Train Your Dragon, Cressida Cowell, sat on her custom-made bench and read her book to dozens of her young fans, granting a wonderful experience for the children present. Cartoonist Ralph Steadman was also about, disguised as the Cat in The Hat promoting the Dr. Seuss book bench. At the end of the campaign, the benches will be auctioned at London's Southbank Centre on 7th October to raise funds for the National Literacy Trust to tackle illiteracy in deprived communities across the UK. Talking of benches, we also spotted these nice pop-up shelters for homeless people, in a timely display of altruism as opposed to one supermarket chain's 'anti-homeless' spikes. If you liked the above book-based brand experience, be sure to check out another great literary themed campaign we spotted this week - Penguin Books Australia’s brilliant Dial-a-story campaign in which bookworms can chat to their favourite authors on the phone.